As you may have heard, Google Wave is dead. But why is it dead? 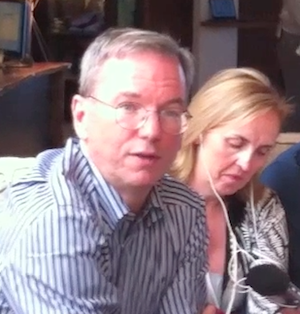 Google CEO Eric Schmidt took some time today after his panel at the Techonomy conference in Lake Tahoe, CA to answer that. When BBC reporter Maggie Shiels asked about the reasons behind the product’s demise, Schmidt noted that Google liked the UI and a lot of the technology behind the product, but it simply to take off. “We try things,” he said. “Remember, we celebrate our failures. This is a company where it’s absolutely okay to try something that’s very hard, have it not be successful, and take the learning from that,” he continued. If something does hit, he noted that Google gets strongly behind it. That simply wasn’t the case here. Schmidt also said that Google would be taking the technology behind Wave and applying it to technologies that they haven’t announced yet. Everyone believes this will be Google’s next big push into the social space (which executive Vic Gundotra will apparently be leading). He says the Wave guys are going to be working on things like Wave — but again, things that aren’t announced yet.